Remove the cover from the box and place the bundle on the top of the canopy frame. Unroll the replacement canopy down the length of the frame. When completely unrolled, unfold the cover across the top of the canopy ribs and position squarely on the frame. The black Quiklash webbing should now be on the inside and right behind or slightly above the aluminum canopy frame going lengthwise. To read more about the Quicklash attachment system, click here. This canopy uses individual bungees with a metal hook on the end. 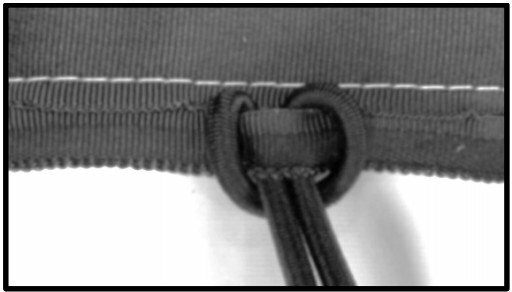 Attach each bungee through a perforated hole in the Quiklash webbing directly in-line with each canopy rib (fig. A.) 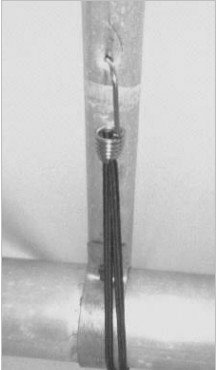 Stretch the bungee underneath the round aluminum canopy frame and upward until you are able to insert the hook into the hole in the corresponding frame rib. Alternate from side to side and end to end to make sure the top remains centered on the frame and is pulled evenly from all sides.